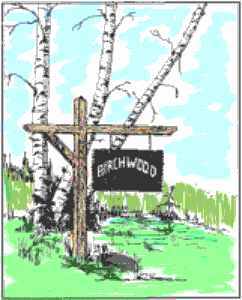 Birchwood is located 3.6 miles north of Three Lakes, Wisconsin on County Road X. It has 300' of shore line on Little Fork Lake. This is the center lake of a chain which extends in three directions. The cottages are located on an elevation which provides a beautiful view overlooking Little Fork Lake. They have a scenic setting of maximum privacy among beautiful white birch, pine, oak, and maples, with a convenient stairway access to the water facilities. Adjacent to the cottages is a large area for pic nics, barbeques (grills provided), horseshoes, and other sports.